Propeller: Good material, blade shape is not very suitable, large diameter and large pitch. 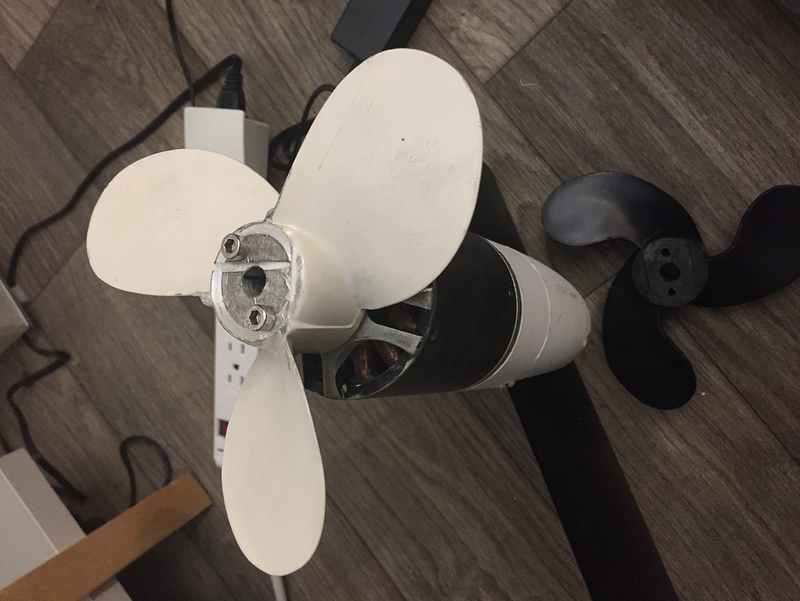 Although MAT uses a plastic propeller (https://efoil.builders/uploads/default/optimized/2X/2/22fb77b91e22a123a1c8b8851e5a372ea3c9ca16_2_999x750.jpeg), which has a similar pitch, but plastic blades at max RPM partially equalize under water pressure, which will cause the propeller pitch to decrease. Hi Alexandre. Yeah figured I try the old prop first. I’ve modded it to fit the 80100 and it’s on the printer now, I’ll let you know if there’s any improvement. As far as the batteries go the voltage should be the same, both Lipo and Li-ion are nominal at 3.7V. The only different I can think is that the lipo continuous discharge is way higher than Li-ion. That said the LGMJ1 has a max continuous of 2.86C, so given 3.5 Amp per cell and 12 in series the pack (42Ah) should be able to supply 120 Amps continuous. I hope I’m not pulling as many as that!!? I guess I’ll make one change at a time and see what works. 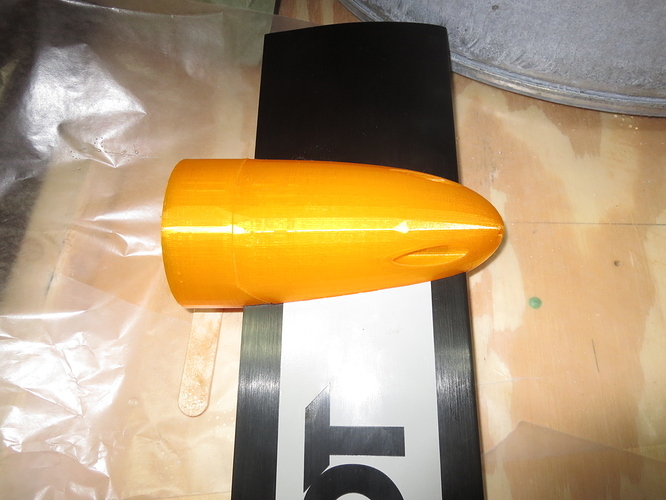 Also considering making a mount to run the inrunner and gearbox wet, I mean it was running wet just fine inside the pod, I just didn’t know it! This way at least I can make the mount something similar to Mat’s 80100 which will make service a breeze. It wasn’t supposed to be easy!! Ok so back in business. Thanks for the help guys. I printed the same prop as with my geared setup, just with a quick 80100 mounting mod. Just back from a test ride with 20 mins on the foil and back to 30+kph with 67% battery remaining. Battery is running way cooler, so I’m pretty much back to where I was with the geared setup. Happy now! I do notice this motor sounds a bit like an old dial up modem or fax machine. Anyone else notice this? @foiledagain, Does it mean that on the shelf props 7.5/5 are much less efficient ? What is this prop you just printed? 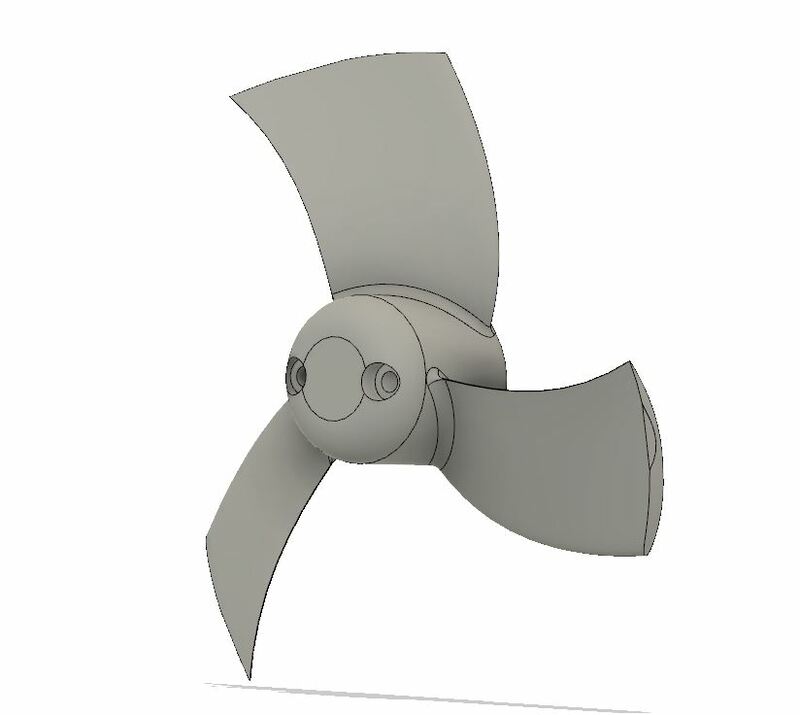 Can you please share your fusion360 file with this modified prop? Btw in your test was it opened or ducted? I hope this works. I’m new to uploading stuff. I’m running ductless for now. @foiledagain Would you mind sharing your old 142mm propeller for the 500kv motor? i did scale down props and still having good top speed with 135mm diameter props, and lowering amps. I get the strange noise depending on the prop I use. My higher pitch prop makes more noise. @Halifax21 Darrel, I also have a Slingshot mast. Any chance I can get your file for the mast clamp? I use Fusion 360 so I’m not sure what the correct file format is but is you send me a STEP or an STL file I think I could mak that work. Thanks. Thank you Darrel! Will start a print this afternoon. Turned out great. Thanks again Darrel. I love the Tampa Hackerspace orange! @Mat What size are the bolts for the mast clamp to motor? Still waiting on Alien Systems to deliver the motor so I’m trying to prepare! Do you also know the size of the connections on the motor? Thanks!